3D effects are the new love of people to enhance the visuals of any webpage. So, if you’re amongst those people who wish to give their website a new way of visibility via 3D effect then you must add jQuery 3D effect plugins on your website. 3D effects will keep the audience hooked on your website and in this way your webpage will experience lower bounce rates. In the market, there are a lot of readymade jQuery 3D Effect plugins available with which can give 3D visuals to texts, galleries, homepage and more under a single roof. You don’t need to do coding neither you have to ask a developer to do it. So, here we’ve collected some of those jQuery 3D Effect Plugins which brings amazing 3D effects to your website. From galleries to menus & text, 3D can take the user experience to the next level. These plugins are highly customizable so that one can make easy changes according to their requirement. And the best part of these plugins are, you just need to do copy and paste the given jQuery code which requires only some basic knowledge of programming and your work is done on the fraction of time. So, without any more further discussion, get a glimpse below of how these 3D jQuery plugins will look on your website. 3D Touch Carousel comes with the ability to show your slides with an awesome 3D transition. The plugin makes your ideas alive. You can use it as an advanced slider by adding 3 Dimension features on images and create a unique/impressive 3D slider. 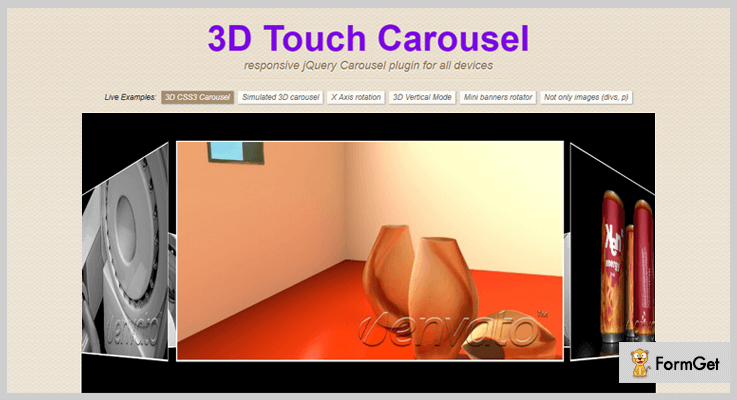 This product is completely a jQuery plugin which is designed for creating a carousel gallery on a website. It supports simulate 3D mode and real 3D mode effects powered by CSS3 to provide a clear & unobstructed design within a 3D environment. The plugin also has an ability to provides a reflection for the images on your website. It supports various effects like 3D CSS3 Carousel, X-axis rotation & 3D vertical mode for image slider. The plugin supports Fallback 3D option with CSS2 effect in order to provide an attractive view in the background. 3D Touch Carousel supports mouse wheel function which helps to add further interactivity to your HTML5 web pages. The plugin consists of auto play mode with which your slider can move automatically with 3D effects. For the above features, you have to pay only $9. And, if you want to get its more advanced features just buy its extended license at $45 and enjoy the benefits. 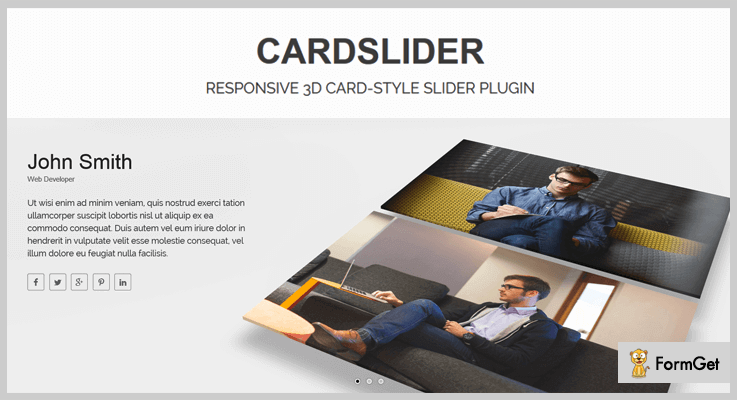 CardSlider is a responsive & light-weight CSS3 3D effect jQuery plugin that aims to provide a simple interface for developers to create a cool 3D slide with various animation effects. This top class jQuery plugin works well on all modern browsers that support CSS3 3D transforms. The plugin makes images into 3D card style and then animate them by using CSS 3D transforms and CSS animations. You can also increase your browsers’ performance by using its hardware-accelerated CSS 3D transforms & animations. It includes dark & light skins background color which make the card slider pages more impressive. There is a full control over its pagination and navigation to maintain your website’s contents and visibility. CardSlider supports autoplay option to move the card slides automatically without any hassle. It allows the sliders to slide in six different directions with shadow and animation effect. Get this plugin at $10 and buy its free updates and live customer support. 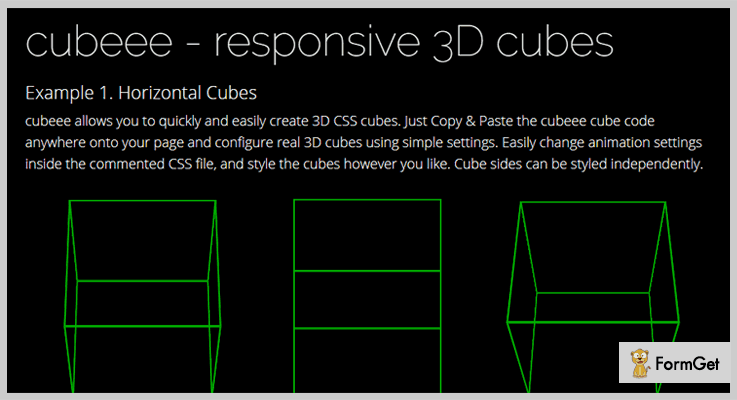 Cubeee is a simple plugin that gives you a full control over creating and styling 3D CSS3 cubes. With the help of this plugin, you can easily control the styling, animation properties, angles, direction or even you can decide to show the animation in 2D or 3D. The plugin gives you a powerful flexibility to move the cubes on a vertically, horizontally, diagonally etc. It supports any HTML contents inside the cube sides. One can easily customize the cube which matches your site. The plugin also provides hover effects, gallery thumbnails and more. This plugin will cost you $10 for its regular license and for an extended license it will cost you $25. Showroom Slider is a powerful jQuery plugin which enables you to create a stunning slider that contains plane and box elements with tons of animation options. The plugin uses a syntax similar to inline CSS style on an element. The plugin provides a plane element with two dimensions such as text box, images etc to make your site more ease. 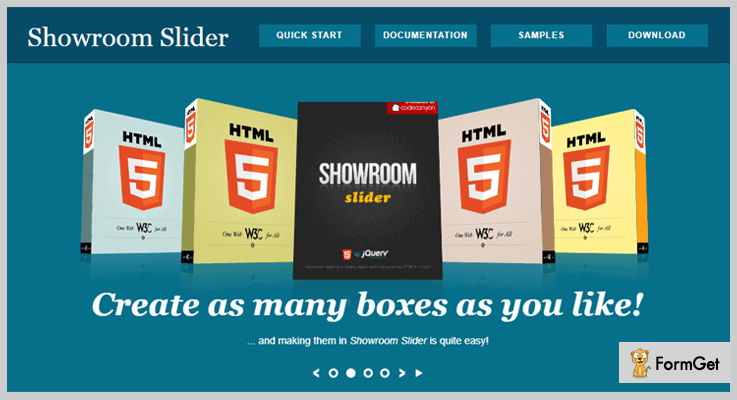 Showroom Slider plugin supports both 2D as well as 3D objects as per the user need. It provides 40+ animation effects that can be readily used on slide and object transitions. 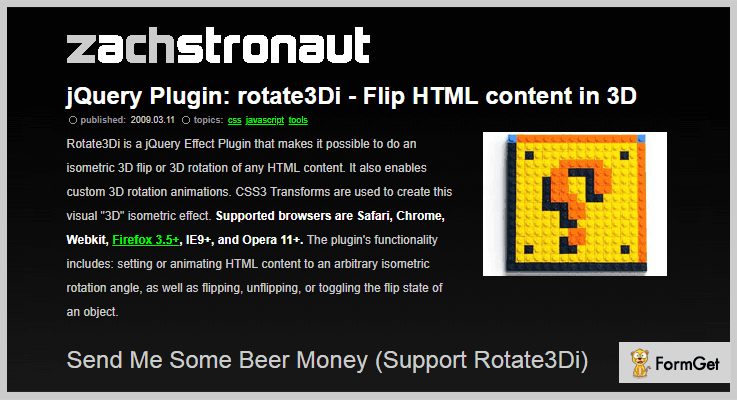 The plugin supports almost every browser. This plugin will cost you $8 and provides unlimited features & functionalities. 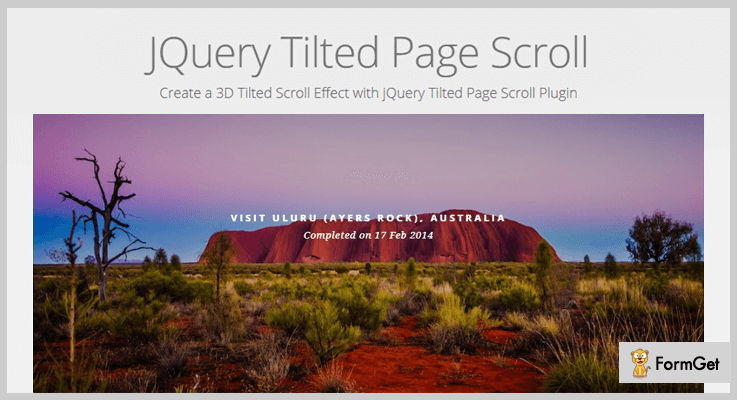 Tiltedpage Scroll 3D effect jQuery plugin is a simple, yet effective which help you to create a beautiful 3D tilted effect on a scroll with jQuery tilted page scroll. With the help of this plugin, you can create a simple layout website in a surprising way. This plugin supports almost all modern browsers such as Chrome, Firefox, Safari on smartphones, desktop & laptops. It provides smooth scrolling effects on every slider of your website. Provides tons of animation effects for every slider. This plugin will cost you $0. You can get this plugin from GitHub’s official site. This plugin is completely free 3D effects plugin that makes it possible to do an isometric 3D flip or 3D rotation of any HTML content on your website. The plugin also enables custom 3D rotation animations & CSS3 transforms to create the visual 3D isometric effect. It supports all major browsers Safari/Chrome/ Firefox etc. The plugin includes functionality like setting or animating HTML content, flipping or un-flipping effects etc. It is fully customizable so that you can easily customize on your site. This is a completely free plugin. You can download this from GitHub’s official website. These were the choices of 5+ best jQuery 3D Effect Plugins we’ve selected for you as per the user’s ratings and reviews. Every plugin in this blog comes with various functions and functionalities which makes your website an user engaging site. Hope these plugins will definitely fit your requirement and needs. Moreover, if you have any other suggestions regarding more 3D effects plugins, then let us know via the comment section below.